Red Nation Hoops - A Houston Rockets Blog: Rockets 120, Wizards 104 - What Did You Expect? Rockets 120, Wizards 104 - What Did You Expect? The Houston Rockets are very, very good. After an incredibly rare blowout to the San Antonio Spurs on National TV on Easter, James Harden and the Rockets reminded the world of who they are. In a season with 63 wins, the aberrant loss will always be more noteworthy, but the wins are what we should expect. With James Harden, Chris Paul and Clint Capela all playing, this was always the most likely outcome. 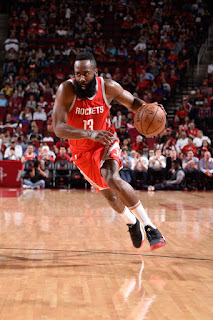 And with an intense late game stretch to obliterate Washington's final, fruitless run, James Harden reminded us why he's a lock for MVP this season. 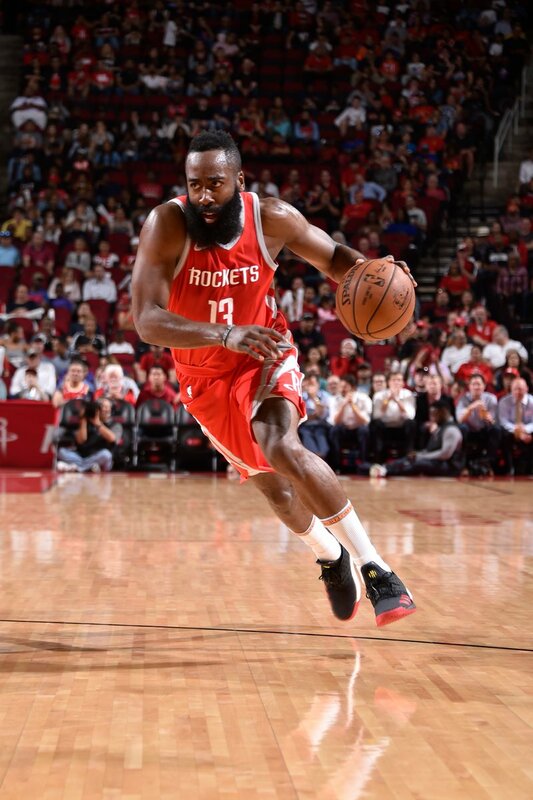 James Harden ended the night with an incredible line: 38 points on 12-18 shooting, 5-8 from downtown, 10 rebounds, 9 assists, a steal and a block. There's a reason James Harden is going to win MVP this season, and it's the same as the reason why the Rockets have won 63 games in 78 tries. The Wizards rallied a bit in the fourth quarter, cutting to 15 points before James Harden returned for a few minutes to crush their hopes and dreams. He nailed two threes in a row and then laid it up to seal their fate. Whatever plagued then in San Antonio seemed to have stayed in San Antonio. Houston shot a respectable 34.8% from the three point arc, which is pretty good considering how cold they went in the middle of the game. The biggest concern for the Rockets outside of injury is three point percentage, and an uptick is a good sign. They also likely need to be more aggressive with rest, which should help with both of the above concerns. They did rest Trevor Ariza, which he likely badly needs, and were little worse for wear. On the injury front, however, there were unpleasant developments. Ryan Anderson twisted his ankle and left the game without returning. He was able to walk fairly well without assistance, so the hope must be that the team is exercising extreme caution. As long as he's healthy and ready for the playoffs, everything else is secondary anyway. Clint Capela had a scare of his own, getting clobbered in the nose fighting under the basket. It was clearly inadvertent, and he continued to play in the game, but it was a scary minute while he held his face in obvious pain while laying on the ground. This is likely no cause for concern, but is part of the larger trend. The best way to avoid injury is to play fewer minutes. Zero is the best number of minutes of all to avoid disaster. It sounds like the resting will continue to take place in shifts, with head coach Mike D'antoni and his squad worrying about rust or perhaps just indulging in some competitive instinct. The most prudent course would likely be to simply shut down as many players as you can while still fielding a legal team, but barring that resting in shifts seems sufficient. Whatever the case, the Rockets are here to win in the playoffs. Until those playoffs come around, they'll just have to settle for winning in the regular season.